As technologies and cultures change and progress, some practices or activities become obsolete, leaving behind the physical or idealogical shells of their once-thriving presence. Nowhere is this more evident than in major U.S. cities. New York City, home to that icon of progress and technology Times Square, is not immune to this, and the challenge for such places is to find a way to integrate these residual elements moving forward. 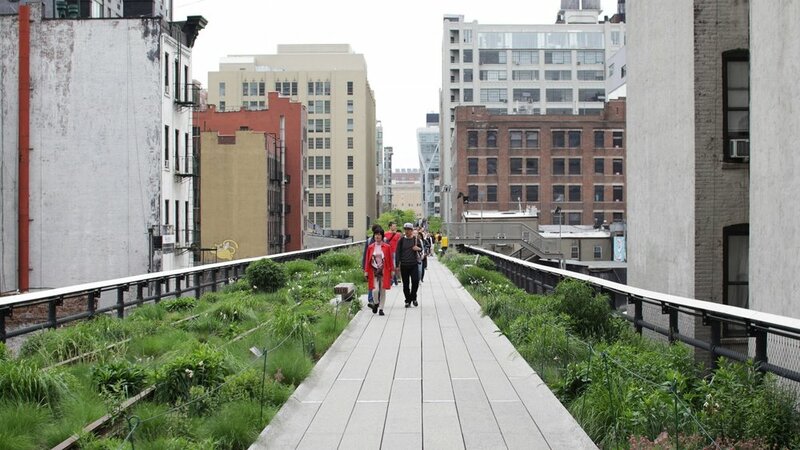 One shining example of the city adapting elements of its past into its current and future plans is High Line Park, located on a mile and a half of unused elevated freight rail line on Manhattan's West Side. The High Line Park turns this leftover infrastructure into a flourishing public park with walking trails, benches and a variety of plant life, giving New Yorkers a place to relax and enjoy some time with nature in the midst of the hustle and bustle of the city. Built in the 1930s to move dangerous rail lines from street level in a busy industrial district to 30 feet overhead, the High Line, which ran from 34th Street to St. John's Park Terminal at Spring Street, traveled down the center of city blocks between 10th and 11th Avenues instead of directly above the streets, allowing it to connect straight to factories and warehouses. But one cannot talk about rail in the mid-20th century United States without also talking about the effects of the highway boom, and the High Line is no exception. As interstate trucking became a more viable means of transportation, freight rail use declined. In the 1960s the southernmost portion of the High Line was demolished, and the last train traveled the line in 1980. Rail lines mingle with plant life on the High Line. In 1999, residents of the High Line's neighborhood formed a group called Friends of the High Line to encourage the rehabilitation of the line and advocate for its reuse as a public space. In 2002 the City came on board, and after several years of design, development and construction work, the first section of the High Line's new incarnation, from Gansevoort Street to West 20th Street, opened to the public in 2009. A second section, from West 20th Street to West 30th Street, followed in 2011. And it's still growing. High Line at the Rail Yards, a third section of park, is under construction between West 30th Street and West 34th Street. High Line at the Rail Yards will extend the park one half mile, and is expected to open to the public in 2014. Planned by the same design team that worked on the first two sections of the park, this third section will include some new features like a dedicated children's play area. Construction is underway on a third section of the High Line park, High Line at the Rail Yards. In 2014 sustainability is more popular than ever in conversations of urban development, and rightfully so. Life surrounded by steel and concrete alone is untenable on a number of levels, and the need for incorporation of natural elements is pressing. Fortunately, New York City and others have shown that it is possible to adapt these spaces and breathe natural life into concrete jungles. As U.S. cities look to the improve the future, there is value in looking to the past. It just might have laid the tracks that can move us forward.